Waterbased, fast drying, flexible coating for exterior walls. 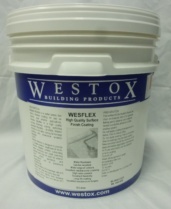 Wesflex has outstanding water resistance and crack spanning abilities. 5 – 6m2 per Litre per coat.